Say What? I Thought These Guys Were On Our Side in the GMO Labeling Fight! An overwhelming majority of consumers want labeling of their GMO foods. Still, so far, the government has lent its ear to the lobbysists who represent the likes of Monanto right? Um, yeah, sure but did you know that the likes of Naked, Horizon, Alexia and Cascadian Farms are also funding the opposition in the Proposition 37 fight in California for GMO labeling of our food? I mean I thought they were on our side? What a joke. It would be funny if it wasn't such a let down. Remember, if Proposition 37 passes in California next month, the GMO labeling initiative will most certainly travel through the entire country benefiting us all. I just thought you, like me, would like to know which organic, natural and traditional brands are standing against us in the fight for GMO labeling and actually funding the opposition. Sadly there are a lot of my favorite brands on this list and it is time to flex our collective green muscle. I will not buy from them any longer unless they change their ways, will you? I mean seriously did they think they would get away with this without consumer backlash? 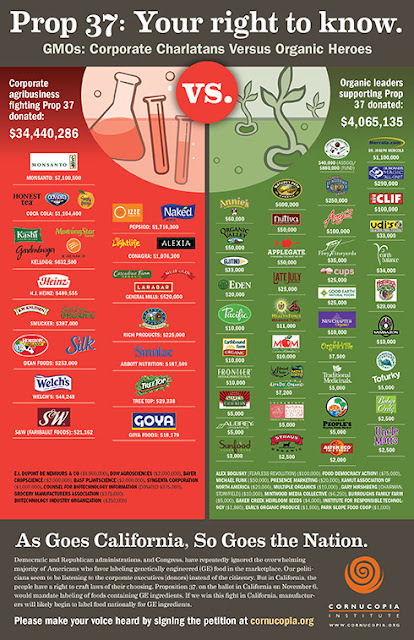 • Ask the big name organic brands/companies that are missing in action on Prop 37 to pony up. Talk is cheap! • Thank independent organic businesses that have put their money where their mouth is. • Tell the corporate players opposing your right to know what’s in your food that if they want your business, they can’t sell-out organic values.